Big inns, even if they are mostly an anachronism in a traditional medieval RPG, are definitely a big part of what we expect when playing RPGs. I have inns and coaching inns turning up fairly frequently as a place to gather information, sleep, and eat. Even more importantly, they act as a signpost of civilization. Coming across a walled coaching inn along the road means that you are somewhere safe-ish, or at least on the verges of civilization. Four Javelins Coaching Inn is the kind of establishment you find either just outside of a small city, or about one day’s travel out along a major road. It is a large stone two-story structure with a wooden stable and coach garage set beside it. As an inn, the establishment provides food, drink and lodging for both travelers and their horses and coaches. The large dining room (The Manticore Room) is reserved for large dinners and rich guests – the majority of guests take their meals in the main hall, sitting room, or even in the enclosed courtyard when the weather is nice. 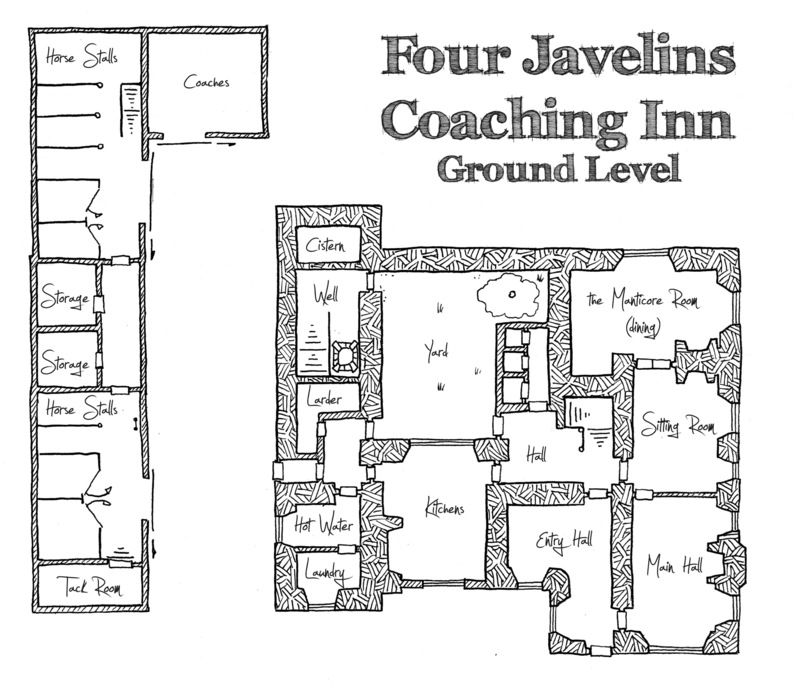 The Four Javelins Coaching Inn was drawn first in pencil on 5-quad graph paper and then inked using a Sakura Micron 02 for the walls, and a Sakura Micron 01 for the details and hatching. The design is based on the floorplans of a couple of large British inns that I dug up along the way. 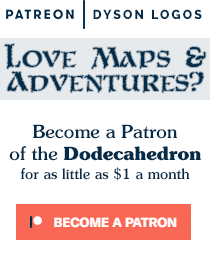 It is made available for your free non-commercial use thanks to Mark Hassman, Ernest, Mike Firoved and the other 129 patrons who keep these maps flowing through my Patreon campaign. Very pretty. Not completely the same as the things you have been producing for us these last weeks. Sometimes I like to see what “civilization” looks like when it comes out of your pen.